This is the last of the “easy midweek” recipes from my summer baking project. If you read my “Coming Attractions” post, you were perhaps expecting “Banana Crunch Cake” from King Arthur Flour’s Whole Grain Baking , but I decided to bag that recipe and do something that wasn’t on the original list I started this project with back in June: “Moist and Nutty Brownies” from Dorie Greenspan’s Chocolate Desserts by Pierre Hermé (Little, Brown, 2001; p. 61). This is an incredibly easy and simple brownie, with only six ingredients, that won rave reviews at work when I brought them in. Those are the six ingredients: 145 g of toasted and lightly chopped pecans, 145 g of Valrhona Caraïbe 66% baking chocolate (called out explicitly in the recipe), 260 g of unsalted butter, 250 g of sugar, 140 g of all-purpose flour, and four eggs. The recipe specifies that the nut pieces should be large, and I rather agree — I’ve made brownies with supermarket chopped nuts, and the texture that you get from larger, less uniform pieces is vastly superior. Hermé, writing for himself in a sidebar, notes that while walnuts are traditional, he prefers pecans for this recipe; I personally prefer walnuts pretty much all the time to pecans, but since I have a coworker who’s allergic to walnuts, and since Hermé himself suggests using pecans, I went with the flow and used them myself. The batter is prepared by first melting and cooling the chocolate, then beating the butter until smooth before mixing the cooled but still liquid chocolate into the butter. Eggs, sugar, flour, and nuts are added, in that order, taking care not to overmix or beat air into the batter. (I used a hand mixer through adding the sugar, then switched to folding with a rubber spatula for the flour and nuts.) 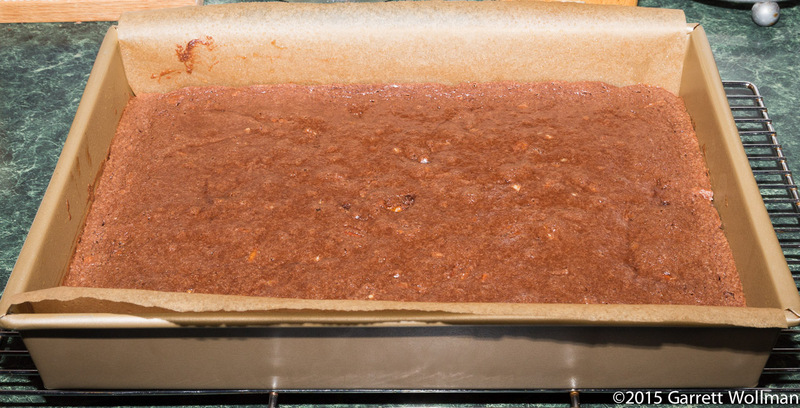 The batter is poured into a 9×13×2 baking pan which has been prepared with baking spray and a parchment sling, and baked in a 350°F (175°C) oven for 19 minutes. I used the parchment sling to remove the brownies from the pan and let them cool on the rack overnight, inverting the pan over the top of the brownies to cover them. Because they are still sitting on top of the parchment, there’s no issue with the soft brownies sinking through and getting stuck on the wires of the cooling rack. The recipe calls for larger than usual portions, with a total yield of 18 (versus 24 for a more typical recipe baked in this size of pan). Even at the somewhat increased size, they are still very easy to munch through without realizing — if like me you need to watch what you eat, I’d advise giving these away as quickly as possible! This recipe is considered “A Very Low Sodium Food” under FDA guidelines. This entry was posted in Food and tagged brownies, chocolate, Dorie Greenspan, Pierre Hermé, recipe. Bookmark the permalink.